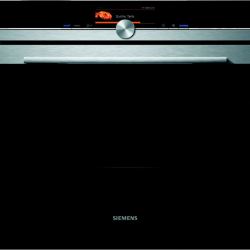 As we have previously discussed at great length, the Siemens range of appliances are among the very best and the iQ700 range is right up there with the greatest. In this case we are talking about the HM678G4S6B stainless steel single oven. Firstly, we must absolutely tell you about the miracle activeClean feature. If you’re sick an tired of scrubbing the inside of your oven, then you’ll be ecstatic to learn that with activeClean you will never have to worry about this ever again… And we mean ever. The oven uses patented technology to completely destroy grease and grime, leaving only a fine powder which can be merely wiped away from a damp cloth. No scrubbing, no chemicals, no effort. This is exactly what the Jetsons enjoy in the year 2062, but you can have it now. The HM678G4S6B is not just an oven, it’s also a microwave. In fact one of the best microwaves you’ll ever use, featuring such enhancements as telescopic rails and a full colour TFT display. Not only this, but with Home Connect you can access all of these options through your smartphone. Now isn’t that cool? Well you haven’t heard anything yet! It’s also possible to combine microwave and oven modes, for example starting a baked potato using the microwave and finishing off using the oven. All this from the comfort of your bed, or even the bath if you so choose. The possibilities are truly endless, and limited only by your imagination. The future is now, the future is Siemens – Available from Silke today!